We use the Reach & Wash System ® which is a market leading water fed pole system. 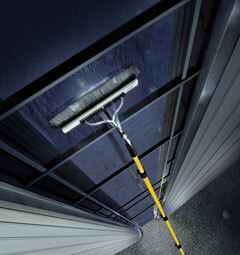 This means that from the safety of the ground, our staff can clean windows with pure water (free of impurities) and remove any dirt with a soft double trim brush head up to heights of 80ft. The Reach & Wash System ® cuts down disruption at your premises reduces the time we are on site and is the most cost efficient and safest way to clean your windows. Another clear benefit is that we clean your frames & sills at the same time as your glazing all included in the one price.